My primary school in the Netherlands was excellent, especially with regard to history lessons. So I was taught, like most Dutch school children were and are, about the heroic deeds of Admiral Michiel Adriaensz. De Ruyter. Michiel de Ruyter led the Dutch fleet up the Thames, I learned, breaking the chain that the English had placed across the river, thereby defeating the English and winning the second Anglo-Dutch sea-war in 1667. This feat is commemorated this year, so I decided to investigate the events in a little more detail by reading some contemporary accounts. To my surprise the chain was not placed across the Thames but across the Medway; and, of course, the Dutch did not sail up it to London, but to Rochester (see modern map below). Last but not least: from our sources it appears that the chain was not broken, but ‘sailed over’, perhaps because it was far enough below water level. Other sources, not discussed here, may contradict this sequence of events, but the English were defeated in the second Anglo-Dutch war; that is a historical fact. My primary school teacher clearly had not read these contemporary accounts of the achievements of the Dutch fleet. If he (not she!) had done so, he would have been able to tell us that Dutch narrators of the period were not very familiar with English river names, and mainly referred to the Thames as ‘river by London’ and the Medway as ‘river by Rochester’ thus confusing Dutch school children 300 years later. Our teacher would have told us that since De Ruyter was the Admiral of the Dutch fleet, he did not cut through the chain himself, but that it was the brave captain Brakel who ‘sailed over’ the chain and managed to negotiate his way between the ships, deliberately sunk by the English to close off the Medway, and sail all the way to Rochester. Brakel and the Dutch fleet then captured and set fire to various royal ships, including the Royal Charles, and captured Upnor Castle, all of this depicted in this etching from Het leven en bedryf van den Heere Michiel de Ruiter….beschreeven door Gerard Brandt (1687). 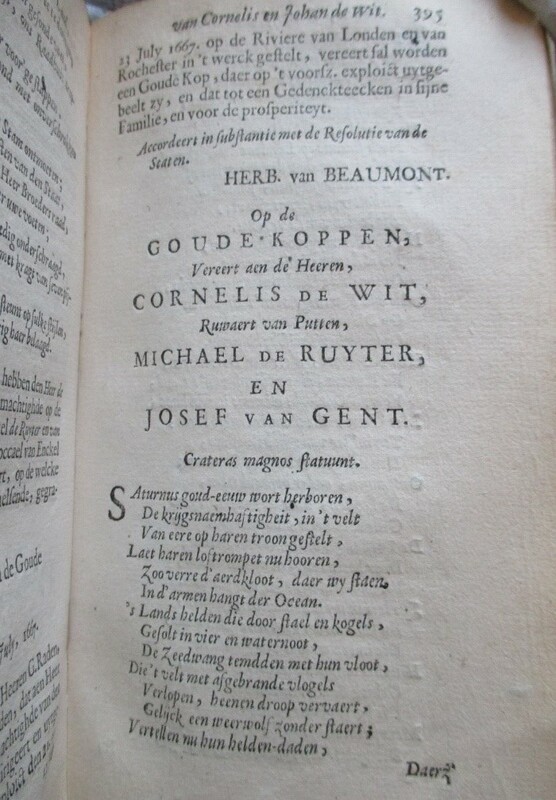 My school teacher was right to portray De Ruyter as a hero since he was regarded as such at the time: Both De Ruyter and De Witt were bestowed with specially engraved golden cups in recognition of their achievements in the Anglo-Dutch war, as reported in Historisch Verhael en politique bedenckingen aengaende de bestieringe van Staet- en Oorloghs-Saken: voor-gevallen onder de bedieningen van de Heeren Cornelis en Johan de Witt (1677). The States had given orders for the fleet to set sail for the ‘River of London’ (p.365). 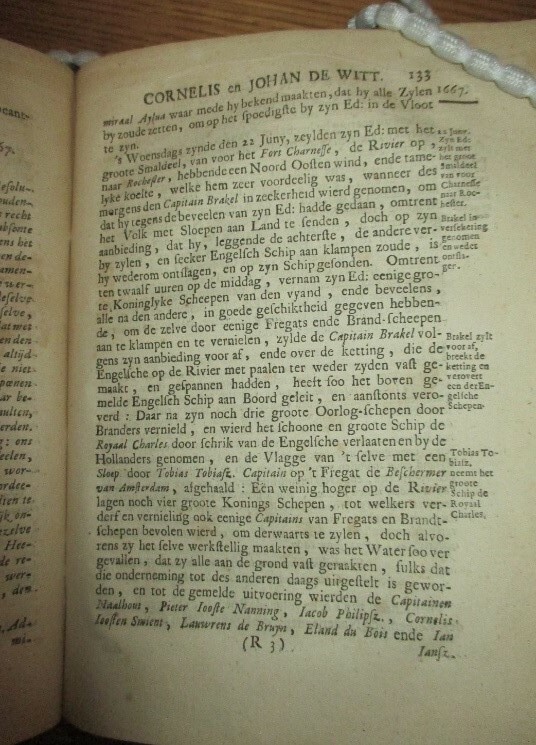 On p.394-395 the ‘Goude Koppen’ (golden cups) are mentioned. This part of the second Anglo-Dutch war, well-known in the Netherlands, is being commemorated this summer with a programme of events in Chatham and London. This includes the exhibition ‘Breaking the Chain’ at the Historic Dockyard Chatham, which vividly brings to life the story of the Battle of Medway with collections from The Royal Museum Greenwich, Rijksmuseum in Amsterdam, the Dutch National Maritime Museum, the Michiel de Ruyter Foundation and the British Library. I have limited my investigations to materials available in the Taylor Institution Library. 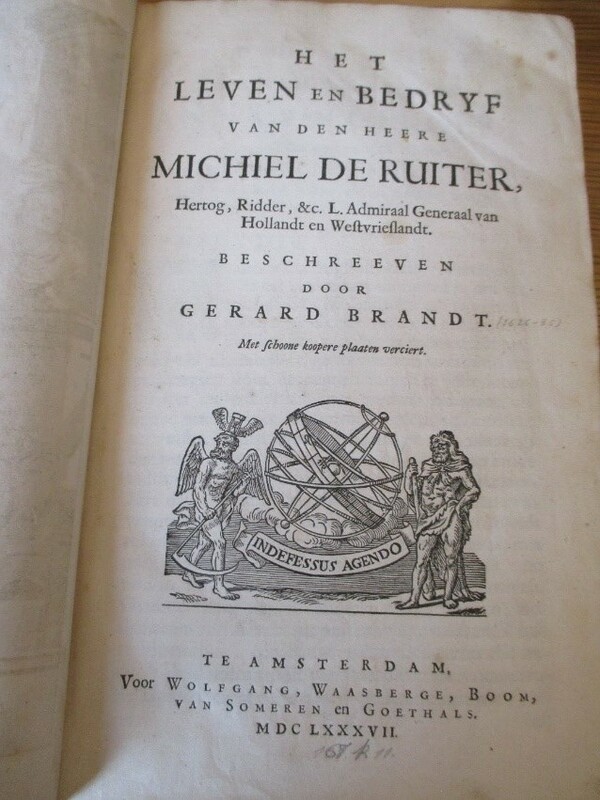 Het leven en bedryf van den Heere Michiel de Ruiter….beschreeven door Gerard Brandt. 1626–1685. Amsterdam : Wolfgang, Waasberge, Boom, Van Someren en Goethals, 1685. Historisch Verhael en politique bedenckingen aengaende de bestieringe van Staet-en Oorloghs-Saken, : voor-gevallen onder de bedieningen van de Heeren Cornelis en Johan de Witt. Beginnende A⁰. 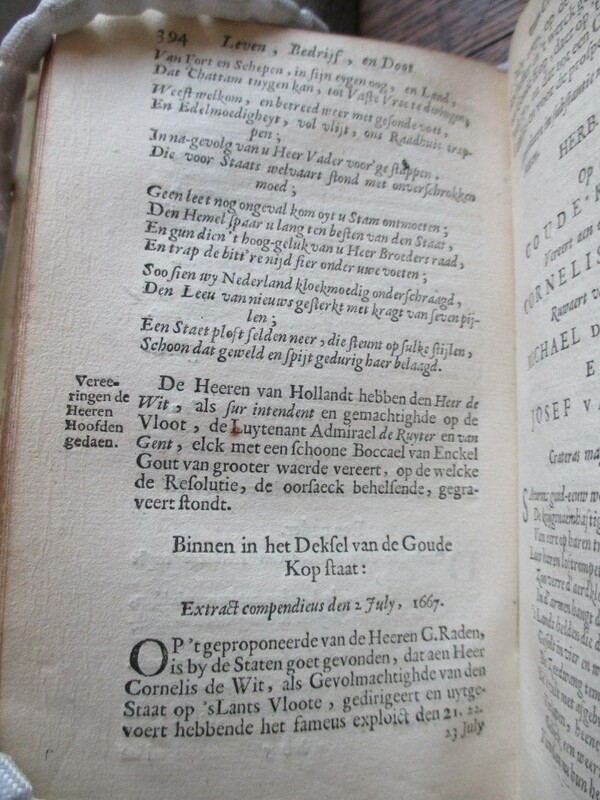 1653. en eyndigende in het Jaer 1672. met hunne Doot. t’Amsterdam, : By J. H. B., 1677. Leeven en Dood der doorlugtige heeren gebroeders Cornelis de Witt en Johan de Witt. 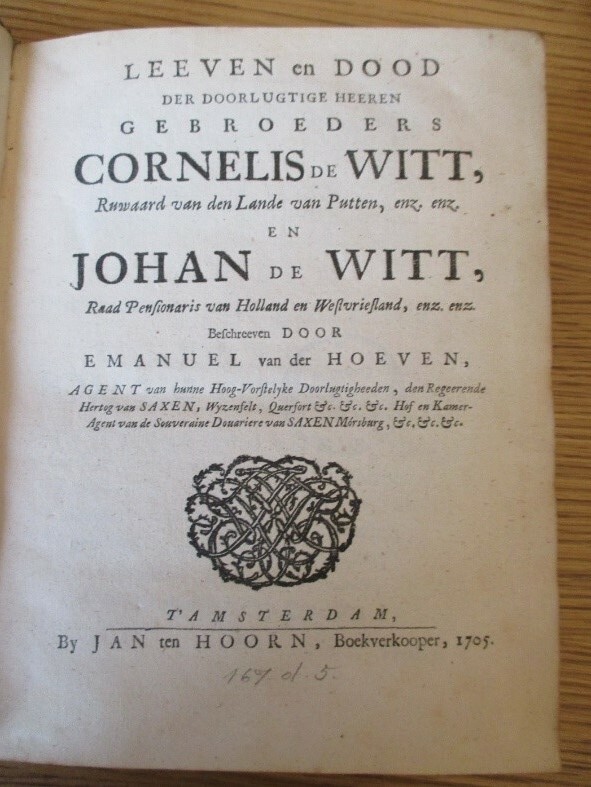 (Life and death of the eminent brothers Cornelis de Witt and Johan de Witt. Amsterdam : J. ten Hoorn, 1705. 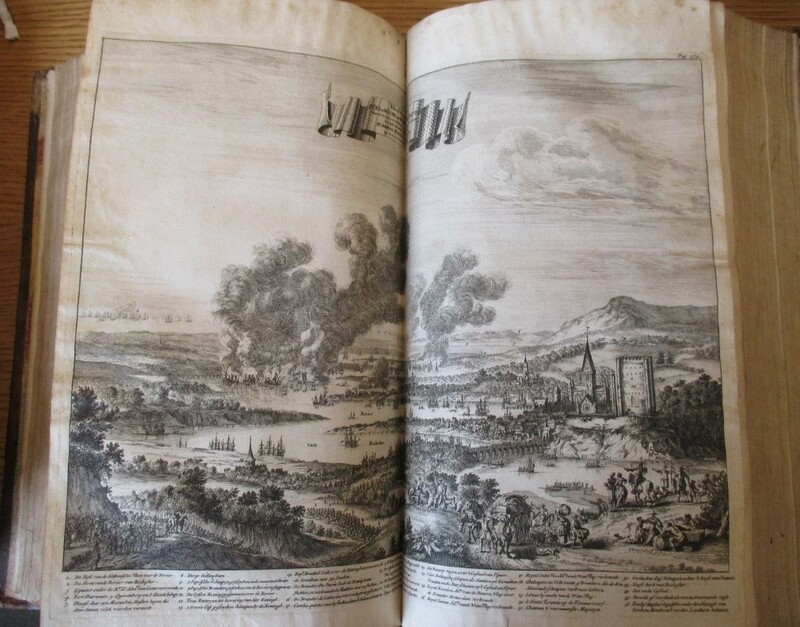 This entry was posted in Collections and tagged Anglo-Dutch Wars, Cornelis de Witt, Dutch, Dutch history, Michiel de Ruyter, Raid of the Medway on 20 June 2017 by ferrarij.